The 55 National Recognition cities, which represent the real places of Texas, include: Amarillo, Bastrop, Bay City, Beaumont, Brenham, Bridgeport, Canton, Canyon, Carthage, Celina, Colorado City, Corsicana, Del Rio, Denton, Electra, Elgin, Farmersville, Ferris, Georgetown, Goliad, Gonzales, Graham, Grapevine, Greenville, Harlingen, Henderson, Hillsboro, Huntsville, Kerrville, La Grange, Laredo, Levelland, Livingston, Llano, Longview, Lufkin, McKinney, Mount Pleasant, Mount Vernon, Nacogdoches, New Braunfels, Odessa, Palestine, Paris, Pecos, Plainview, Rio Grande City, Rockwall, San Angelo, San Marcos, Seguin, Taylor, Waxahachie, Weatherford and Winnsboro. These cities will be further recognized as Nationally Accredited by the National Trust for Historic Preservation next April in Baltimore, MD at the annual conference of the National Trust Main Street Center. “Throughout 2011 we have been celebrating the Texas Main Street Program’s 30 years of progress, having taken our first designated cities in 1981. Recognizing these cities for their efforts in revitalizing their historic downtowns takes on special meaning this year. The programs being acknowledged are large and small from all areas of the state, showing that the Main Street model is appropriate for all kinds of communities with historic downtowns,” said Debra Farst, TMSP state coordinator. National accredited Main Street cities show above average performance in ten categories on an annual report. Selection criteria focus on planning, partnerships, staffing, volunteer effort, preservation ethic, training and program assessment through reporting. For additional information about the national Main Street effort, visit the National Trust Main Street web site at http://www.preservationnation.org/main-street/. 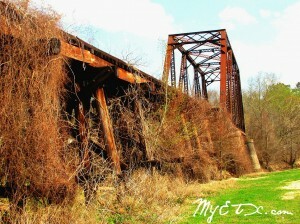 For more information on the Texas Historical Commission’s Main Street program visit www.thc.state.tx.us. The THC’s Texas Main Street Program is a revitalization program for historic downtown and neighborhood commercial districts. It is based on a Four-Point Approach™ — organization, design, promotion and economic restructuring, all within the context of historic preservation. Implemented in 1981, the program has assisted approximately 165 communities throughout the state. For more information, contact Debra Farst at 512/463-5758. JEFFERSON- The Historic Jefferson Railway captures the spirit of the Civil War during Pilgrimage & Civil War Weekend in Jefferson, May 4 and 5, 2013, by telling the story of the Great Locomotive Chase and reenacting the event with soldiers from the North and South. 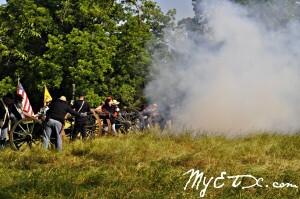 The living history camps along the Big Cypress Bayou come alive as the cannons fire and the battle rages to gain possession of the train. The gripping tale of The Andrews Raid is the Civil War’s most fascinating railroad story. Jefferson – Since Jefferson played a key role in the Trans-Mississippi Department’s military/industrial complex, Jefferson is a natural location for hosting a Civil War Symposium during the current Civil War Sesquicentennial on Saturday, August 18, from 8 a.m. to 5 p.m.